A few days ago, me and the father side of my family went to Cebu. 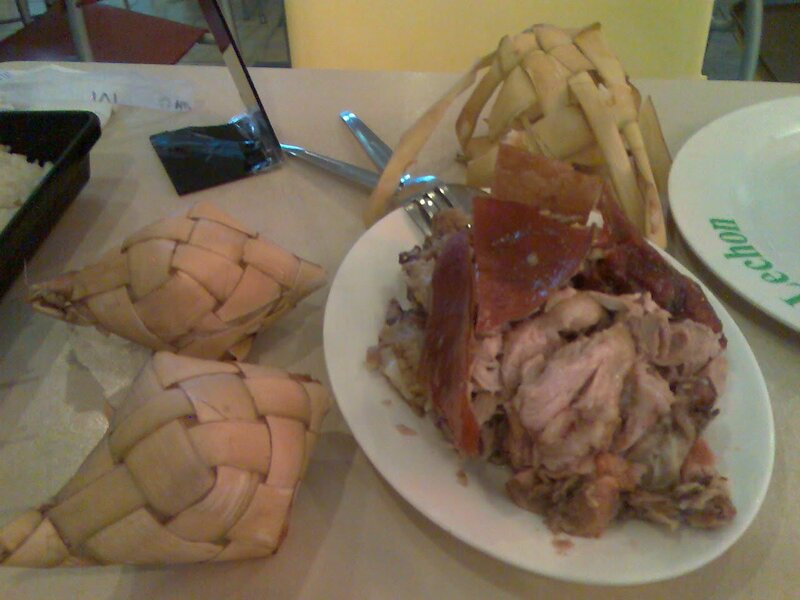 According to most I’ve asked, Cebu’s primary delicacy is their lechon. I’ve first tried their lechon at the hotel we stayed in, and I must admit that it was far superior than the ones we have at Manila. Of course, it could be because this was a five-star hotel quality lechon. A couple of days into our vacation, I had the opportunity to try out their real local lechon at the food court in the only Ayala Center in the city—CnT Lechon. The queue was visibly long, and the menu was simple. Lechon. No fanciness attached. You order it by the kilogram, and it costs 440 Php per K. Since a couple of us were eating, we ordered half a kilo (220 Php). 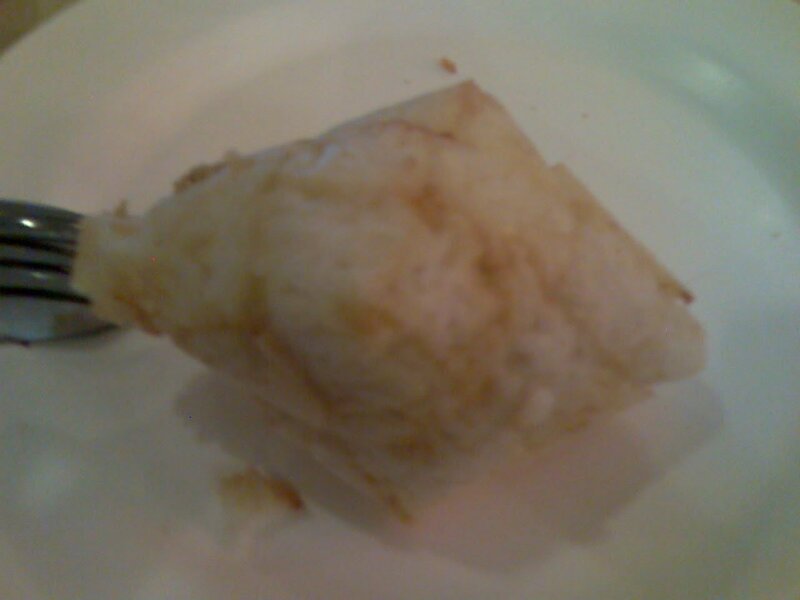 In addition to that, they serve rice wrapped in the same stuff suman is wrapped in, which costs 7 Php each. It took a while before our turn in the queue, but once we’re up, the server chopped up and measured the lechon and put it on a plate quite simply and quickly. It was a very generous plate. I guess I sort of underestimated how much 1⁄2 kilo is. It was way more than what me and my cousin could eat. I was a bit unhappy that there were only a few of the skin, but I guess that’s how it goes. The skin was grand, but the meat itself was a bit disappointing. Of course, I’m comparing it to the one we had at the hotel. Compared with the usual Manila lechon, this meat was noticeably tastier and more succulent… just by a bit, though. According to our guide, the reason for this was because they marinate the pig inside out before roasting it. Another sad part about our order was since we can’t really chose which part of the pig we get, the taste varies from bite to bite. Sometimes, the meat was saltier than previous chunks. Aside from the flavor, the fats on this lechon isn’t as much as the ones I’ve had in Manila, which lets me eat more pork than I usually can before I get tired of it. The rice was a bit harder than the usual cup of rice. However, like the lechon, it was noticably tastier. It had a charred flavor on the outside and a soft finish at the center. But rice is rice, and I went here for the lechon. It was a good piece of pork. The only better one I had was the one at the hotel, and it beats this by a wide margin. The local Cebu lechon is a bit more flavorful than ones I’ve eaten in Manila, but only by a bit. I guess the best part about this is the quantity and the value for money. For around 250 Php, the two of us had leftovers good for at least one more person, something I have yet to experience in Manila, where I only get to eat lechon at buffets and at meager quantities on food courts. Not recommended for: Lechon haters. Smart nomnomnom tip: 1⁄4 kilo is good for one very hungry pork lover or 2 people—base your order on this estimate.